Hippydan received his first dudelsack as a wedding present from his wife. It was made by a pipe maker from Mainz Germany named Ralf Spät. Hippydan now has three sets from Ralf, as well as a Highland Bagpipe from Scotland. 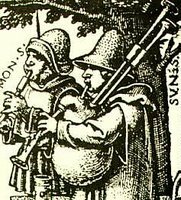 The dudelsack (A German medieval bagpipe) probably made its début around the beginning of the second millennium A.D. As the various Barbarian rulers began to lose power and high medieval civilization began to appear, the bag & pipe made there way into the lives of the common folk. This was a party instrument. It was played at wedding and festivals, it was used in plays, and would usually be found where ever there was drinking and feasting! One of the first people groups to put a bag & pipe together was the Romans in the first century A.D. Prior to that there were many different kinds of reeded pipes. They were played by nearly every ancient civilization from around 4000 B.C. on. Blowing the reed pipe became an art form. One could day that the very first "bag" that was put on a "pipe" was the piper's cheeks! The ancient pipers would circular breath, (much like a didgeridoo player) to keep a constant stream of air flowing through the reeds of the pipe. This technique was passed down from teacher to student for nearly 4000 years! Thus, to put a bag on the pipe was in a since "cheating." Yet around 60 A.D. the extremely intelligent and very talented emperor Nero may have been one of the first "cheaters" to ever play one of these bag & pipes. It has even been remarked that Nero did not play the fiddle when Rome burned to the ground, but the bagpipe! Well, to say the least, the true pipers in Rome looked down on this new instrument and it never really took off. Yet, throughout the dark ages, after the fall of Rome, (c. A.D. 500-1000) the technique of circular breathing was lost to civilization. 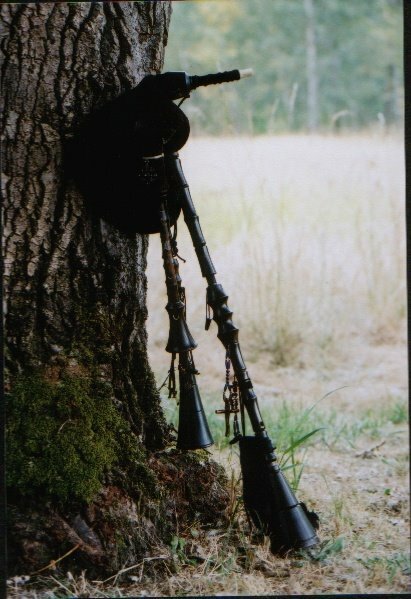 However, some old tales and legends survived of a leather bag and a shepherds reed pipe being played together down in Italy. Thus, we have come full circle and that brings me back to my first paragraph. The Bagpipe : The History Of A Musical Instrumen.t Collinson, Francis M.
Odon Soterias has been playing the penny whistle ever since the beginning. Annika first picked up a penny whistle when Hippydan gave her one in Seattle WA. That very afternoon Hippydan and Annika were asked to play live on the air at a local radio station. Annika had been playing the whistle for about 2 or 3 hours before this live session! I have heard it said that when the English outlawed the bagpipe in Ireland, the Irish developed the penny whistle. Thus they could continue to play and dance, but if the English showed up, the little pipe could be stowed away right quick couldn't it? Hippydan bought his first bouzouki while working at an international music store in San Francisco CA, called Lark in the Morning. This instrument is still one of the main parts of Odon Soterias' sound. The bouzouki originated in Greece but it has become an essential instrument in celtic music. It is an 8 stringed instrument mostly tuned like mandolin (GDAE). The two lower strings (the G &D) have octave strings, meaning, there is a high and a low string next to each other. The high string is an octave higher that its bass counterpart. The mandolin is another instrument that Odon Soterias has been playing since the beginning. An octolin is just a short way of saying "octave mandolin." Thus, an octolin is simply a mandolin that is an octave lower. These two instruments have truly come into there own in the album "How the People Stare". Made by Ed Lynch from Colorado Springs, CO. The Lynch bass was a concept idea by Hippydan. "I wanted a stringed, bass, percussion instrument that could be played with drums and bagpipes." Says Hippydan. He told his idea to instrument maker Ed Lynch and within the year the Lynch bass was made and being used in the recording of the song "Charlotte's Brawl" on the CD "How the People Stare". The Lynch bass will be a valuable instrument to Odon Soterias for years to come and should amaze people when they see this monstrosity of an instrument! And drums from the recycling plant: Odon Soterias' home made barrel drum.